How many: Quite large numbers are usually present for at least part of the autumn and winter. Newly arrived redwings and fieldfares, ever attractive autumn and winter visiting thrushes that typically breed to the east and north-east of Britain, are usually first seen in the New Forest during late September and early October, respectively, and significantly increase in numbers during later October and November. Separation of the two is reasonably straightforward. Redwings are noticeably smaller than fieldfares – they are around the same size as song thrushes - have prominent pale stripes above the eyes and below the cheeks, and possess relatively short tails and rusty-red flanks and underwings. Fieldfares are similar in size to mistle thrushes, their plumage is pale grey on the rump, crown and nape, and they have particularly dark, quite long tails and white underwings. 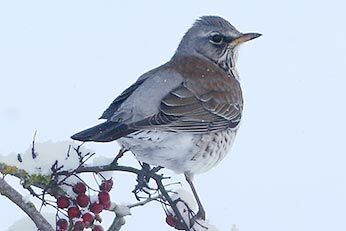 When in flight, the fieldfares’ harsh, often quite loud, chattering calls are distinctive; whilst the redwings’ thin tseeip-tseeip-tseeip utterances are considerably less audible. 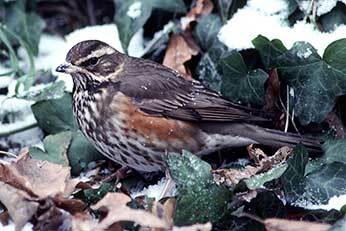 Only very rarely does either bird fully sing whilst in Britain although redwing subsong, a prolonged, quiet, twittering chorus, is sometimes heard, particularly as flocks settle down communally to roost; in the days immediately prior to return migration and whilst flocks rest during migratory journeys. In autumn and early winter, both species can sometimes be seen feeding in quite large mixed flocks, frequently on holly berries or haws. Fruit will also be taken at this time and so will mistletoe, rowan and elder berries. When the availability of local foodstuffs dwindles, however, many of the birds wander widely in search of similar fare elsewhere and may not be seen again until mid- or late winter. Then, on short-cropped grasslands they can often be watched hopping or running a few paces, stopping with head cocked to look and listen for tell-tale indications of invertebrate presence and eventually jabbing the earth to take whatever morsel has been detected. Flocks of redwings, but rarely fieldfares, also regularly enter woodland interiors to feed amongst the leaf litter and to roost communally within the sheltered confines of hollies and other evergreens. Such flocks are usually of modest size although huge numbers of birds are sometimes involved – in late November 2009, for example, it was estimated that 60,000 redwings were roosting in Broomy Inclosure, whilst in late November 2010, 15,000+ were recorded flying into Long Beech Inclosure. By early April, most of these birds will have begun their journey back to distant breeding grounds. The Birds of the Western Palearctic: Stanley Cramp, et al.